The first wine region we visited on the Germany-East Tour 2016 by ombiasy WineTours was the Saale-Unstrut Region. There, we visited 3 wineries: Weingut Lützkendorf, Weingut Bernhard Pawis and Weingut Heil. The former 2 are heavy-weights; these are the only 2 members of the VDP, the association of about 200 German elite winemakers, in the Saale-Unstrut Region. Weingut Heil is an up-and-coming wine producer. The Saale-Unstrut wine region sits on 51st latitude and is Germany’s northernmost wine region, located in the valleys of the Saale and Unstrut rivers, an area of the former German Democratic Republic (GDR). The oldest record of viticulture dates back to the year 998 during the reign of Emperor Otto III. Weingut Lützkendorf was founded at the dawn of the 19th century and existed until 1959 when the GDR authorities nationalized the property and integrated the estate into the government run Agricultural Cooperative. In 1991, after the reunification of the two German States the vineyards were returned to the family. Uwe Lützkendorf reestablished the winery, revamped the vineyards, and built new production facilities in Bad Kösen. To listen to Uwe Lützkendorf , and also to his fellow winemakers in this former GDR area, recounting their stories of reviving an economic and agriculture waste land after German reunification, is living history and worthy of a spy thriller. Weingut Lützkendorf is in Bad Kösen on the Saale River; administratively, Bad Kösen is part of the town of Naumburg. The state-run winery Kloser Pforta is also in Bad Kösen. Uwe Lutzkendorf is the winemaker and owner. Weingut Lützkendorf was founded at the dawn of the 19th century and existed until 1959 when the GDR authorities integrated the estate (2 hectares) into the government run Agricultural Cooperative. Udo Lützkendorf, the father of Uwe, was the Director and Cellar master from 1972 to 1992 in what was then the state-owned, and now again state-owned Kloster Pforta Estate, most of the time in the GDR and for 3 years in the re-unified Germany. The Lützkendorf’s vineyards were handed back to the family in 1991 and the Lützkendorfs made their own wine again with the 1991 vintage. What then followed was a major re-launch, including replanting the vineyards, buying and leasing new vineyards and building a winery, including a Gutsausschank (winery tavern). In 1996 the winery Lützkendorf was the first estate in the Saale-Unstrut region to become member of the prestigious VDP, the Association of Germany’s Premium Winemakers. Today, the vineyard area totals 11 hectares, with holdings in the Edelacker (Freyburg), Hohe Gräte (Karsdorf) and Köppelberg (Schulpforte). The area is planted with Silvaner (35%), Riesling, Pinot Blanc, Traminer, Müller-Thurgau and Kerner, as well as with Pinot Noir, Portugieser and Blauer Zweigelt. The stony soils and the climate of this northern wine region decisively influences the character of the wines. Uwe Lützkendorf’s philosophy of wine making is as little intervention as possible to showcase the character of the terroir. The wines are matured very reductively in either stainless steel tanks or in oak vats. With very few exceptions, the wines are fermented dry. Uwe poured an impressive series of wines. 2015 Weingut Lützkendorf Pfortenser Gutedel feinherb. Gutedel is one of the oldest grape varieties in the world. Today, it is a popular grape variety in Switzerland. Thank you very much Uwe for an outstanding tasting. Following the tour and tasting at Weingut von Oetinger in Erbach, we went to Kloster Eberbach, where we had lunch and a tour. The Eberbach Abbey is a former Cistercian monastery, founded in 1136 by Bernard of Clairvaux as the first Cistercian monastery on the eastern bank of the Rhine River. Its Romanesque and Gothic buildings are impressive. The Abbey, including its vineyards, was secularised under Napoleon in 1803. The new owner was the Duke of Nassau. Then, from 1866, Prussia became the owner of the Abbey and its vineyards. Finally, in 1945 after World War II, the Federal State of Hessen took it over. Most of the vineyard holdings of the Hessische Staatsweingüter Kloster Eberbach date back to the days, when Cistercian monks founded the Eberbach Abbey. The vineyards of the Eberbach Abbey were, at 300 hectares, the largest in medieval Europe. We got an in-depth tour of the Abbey, including the visit of the old monk’s dormitory where every year the famous auction of premium German wines takes place. A very special treat was a peek into the treasure chamber, where century old wine bottles are still stored and where the movie “The Name of the Rose” with Sean Connery was filmed in 1986. The Bensheim Estate is the only one located in the Hessische Bergstraße wine-growing region. Grand Duke of Hessen-Darmstadt founded this Estate in 1904, the vineyard holdings total 38 hectares. The main grape variety planted is Riesling (25 ha), as well as Pinot Noir, Pinot Blanc and Pinot Gris. The red wine Estate Assmannshausen at the western edge of the Rheingau has a vineyard area of 27 hectares in the Höllenberg site, of which 25 hectares are planted with Pinot Noir. These two Estates do their own bottling, and market the wines under their own names. The Hattenheim Estate (50 ha vineyard area in the Engelmannsberg, Siegelsberg and Marcobrunn sites). The Rauenthal Estate (48 ha in the Baiken and Wülfen sites). The Rüdesheim Estate (23 ha in the Berg Roseneck, Berg Rottland and Berg Schlossberg sites). The Steinberg (32 ha, a monopole holding). The total vineyard area of the 7 estates comes to more than 200 hectares, of which 85% are planted with Riesling, 10% with Pinot Noir and 5% with other varieties. A few years ago, the Hessische Staatsweingüter built a new winemaking facility and celler just outside the wall of Steinberg, the Steinbergkeller. The Steinbergkeller – a state of the art winery - was a very controversial project. It was constructed for several 100 million Euro. A Bouchon serves traditional Lyonnaise cuisine. Originally, the husband would watch over the dining room and pour the wine (Beaujolais or Côtes du Rhône), while the wife cooked every day, family-style cuisine, centered on the offal and cooked meats which Lyon is famous for. 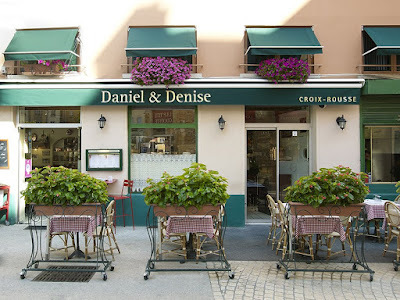 On the Bourgogne and Champagne Tour 2016 by ombiasy WineTours most of us arrived in Lyon, where the tour started, a day or 2 days before the tour. Those of us, who were in Lyon on the evening before the tour started, had dinner at a Bouchon. Because of difficulties to make a reservation for a group of 12 on short notice, we split up into two groups. 6 of us went to Daniel et Denise and the rest (including Annette Schiller and myself) to Chez Paul. A bouchon is a type of restaurant found in Lyon, France, that serves traditional Lyonnaise cuisine, such as sausages, duck pâté or roast pork. Typically, the emphasis in a bouchon is not on haute cuisine but, rather, a convivial atmosphere and a personal relationship with the owner. There are approximately twenty officially certified traditional Bouchons. Here is the current list: Abel, Brunet, Café des deux places, Café des fédérations, Chabert et fils, Daniel et Denise, Chez Georges le petit bouchon, Les gones, Hugon, Le Jura, Chez Marcelle, Le Mercière, La mère Jean, Le mitonné, Le Morgon, Le musée, Chez Paul, Les Trois Maries, A ma vigne, and Le Vivarais. Michelin: It is unclear whether certain establishments are authentic Bouchons or not, even while they offer menus which are perfectly representative of the genre. Chez Daniel et Denise is one such restaurant. For the past few years it has been operating under the toque of Joseph Viola, former chef of Léon de Lyon, serving such specialities as omelette du curé (an omelette generally made with chicken livers) with crayfish and Nantua sauce, le tablier de sapeur (breaded tripe), macaroni gratin and sautéed potatoes to die for. Its pâté en croûte aux ris de veau (veal sweetbreads in pastry crust) is, according to Paul Bocuse, Lyon’s best. 2 Rue des Forces 69002 Lyon Tel: (33) 04 78 37 71 54.